When I think about Kitty now and over the fifty years I knew her, I am inescapably struck by the impression that she achieved a real-life "Dorian Gray" illusion of becoming younger and younger as those years rolled by. I'll never forget my first lesson with her, thinking she was a very old lady ( in 1958 ), but as we all got older she just seemed to stay the same age. She wore her great age with a lightness of spirit which belied those advancing years in the most remarkable way. 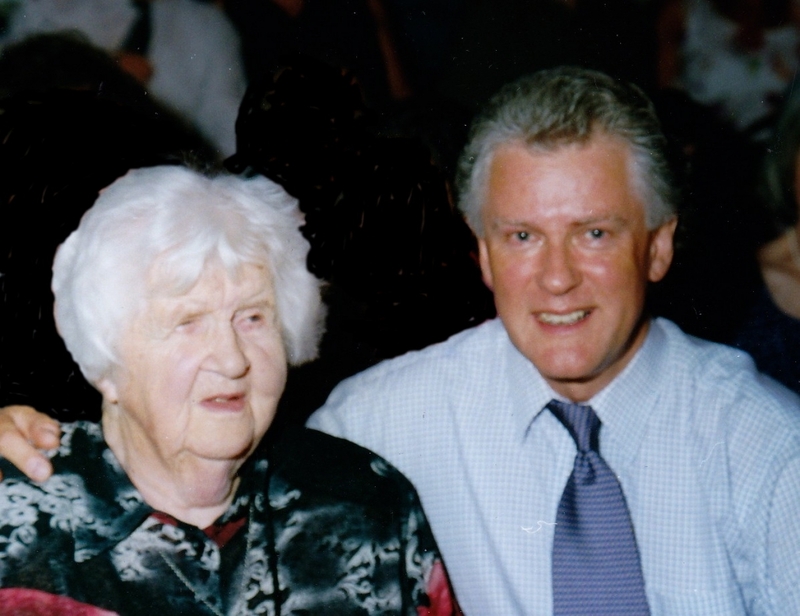 She was truly gifted with a rare ability to enjoy life, even in the face of adversity. I wanted firstly to cover a few facts about her life, as, having lived to such a great age, just short of a hundred and one, her earlier years happened long before many of our parents and even grandparents were thought of. Eleanor B K Gregorson was born on July 9th 1903 in her grandmother's house at Wardie near Granton. 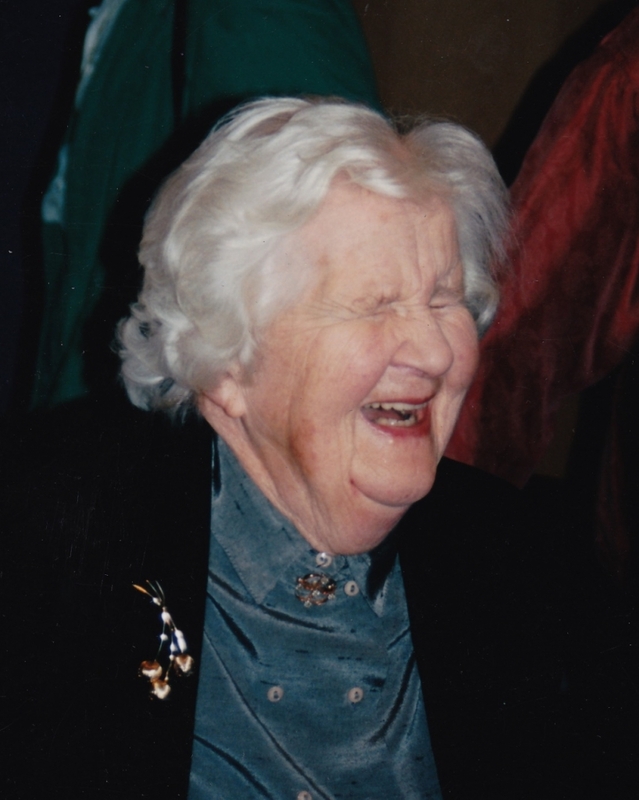 She grew up in Colinton, which was her home for the first eighteen years of her life, though during the First World War she was evacuated with her parents to the Borders. Her mother was a very accomplished amateur pianist whose playing she often remembered falling asleep to in the evenings. Her mother told her that, as a baby, if she cried she was often dumped under the piano while her mother played, and that seemed to do the trick! So she was surrounded by the sound of music from a very early age. Her Father was a lawyer, but, in Kitty's words, not a very successful one. She started to have cello lessons, aged 8, from Ruth Waddell, but as far as schooling was concerned, didn't actually go to a school till she was fourteen, and then only for two years ( to St George's School for Girls ). She attributed this to both economic reasons and her mother's snobbishness about the available local schooling. Life was not always easy. She remembered Zeppelin raids during the First World War, ( climbing over the rubble after a raid, on the way to her cello lessons ) and the deprivations of the war ( shortages of bread and flour), and reading with shock the lists of casualties on the front page of "The Scotsman" newspaper. So many of the young men of her generation were just wiped out. Who knows the effect that may have had on her life? After leaving St George's School, and spending three years in Edinburgh getting work in the Reid Orchestra (conducted by Sir Donald Tovey ), she had made sufficient progress to become a student of Ivor James, one of the leading teachers of his day, at The Royal College of Music in London. The time she spent there Kitty described as, without doubt, the happiest three and a half years ofher life. She came into contact with many of the great names of the day, including Vaughan Williams, Constant Lambert, Herbert Howells, and Frank Bridge, who accompanied her on the piano. She also described how one day a professor suddenly co-opted her into taking part in an impromptu try-out of one of Michael Tippett's Quartets ( most likely the First, or an ealier work ) and feeling overcome by the complexity of the music itself. At the same time, she was proud to have been involved with composers whose music was at the "cutting-edge" and throughout her life she maintained a real interest in hearing ( though not by any means always liking !) new music. But her student days, and, inevitably, her promising career, were cut short when her mother became terminally ill and Kitty had to return to Edinburgh to look after her father and younger sister. As she said, there was no alternative in those days, but, in her own words, it nearly broke her heart to have to give up her studies at the Royal College. Blessed with a strong constitution and an apparently inexhaustible energy, she began getting work as a free-lance cellist in Scotland, again with the Reid Orchestra and as an extra with the BBC Scottish Orchestra, among others. But before long she threw herself into her life's work of teaching the cello. And so it was from that time, seventy-eight years ago, that Kitty gave her life to caring for people in one way or another. To everybody who came into contact with her, she gave her complete attention. She was like a good shepherd to all of us, whether giving advice, preparing for festivals, exams, helping out with instruments, bows, music, providing beds, or food - which she also did superbly, however simple. ( Who will forget her delicious scrambled eggs, like none other I have ever tasted!) Or just being there to listen. No matter what time of the day or night you might call her ( and she was a late bird herself) , she always seemed to have time to listen. "E B K Gregorson" announced the brass name-plate of No 17 Cornwall Street, and whether it was at the Waddell School ( where she first started to assist her teacher Ruth ) or at Cornwall Street, with its magical view of Edinburgh Castle, over the years hundreds of fledgling cellists of all ages passed through her capable hands, trudging up and down the many steps to her flat. But of course it was nothing compared to the number of times Kitty did that, day after day, year after year, laden with cellos, music, music stands, shopping, dustbins, coal, etc. The excercise she gained from that must have been one of the major factors contributing to her physical strength. What remains an indelible impression is the wonderful welcome that she always gave you after the hike up the stairs - plus the top flight operated from above with the Yale lock on the end of a piece of string ! I never recall not looking forward to a lesson with her. She was always solicitous in just the right sort of way, encouraging, cajolling, gently pushing you on, but above all enthusing, so that you felt it was a journey you were making together. At the same time she expected committment, and was always keen to develop a degree of self reliance in her pupils. Her ability to make you feel good wasn't just flattery. She also imparted a real sense of goals to aim for, based on her own sound judgement and experience. She had been lucky to have had the first-hand experience of hearing Casals and all the other international stars ( Fritz and Adolf Busch, Jelly D'Aramnyi, Adela Fachiri, Suggia etc ) that Tovey brought to play in Edinburgh in those inter-war years when they were at the height of their careers, and those performances left a strong impression on her. It is easy to forget that she grew up at a time when there was no radio or records. 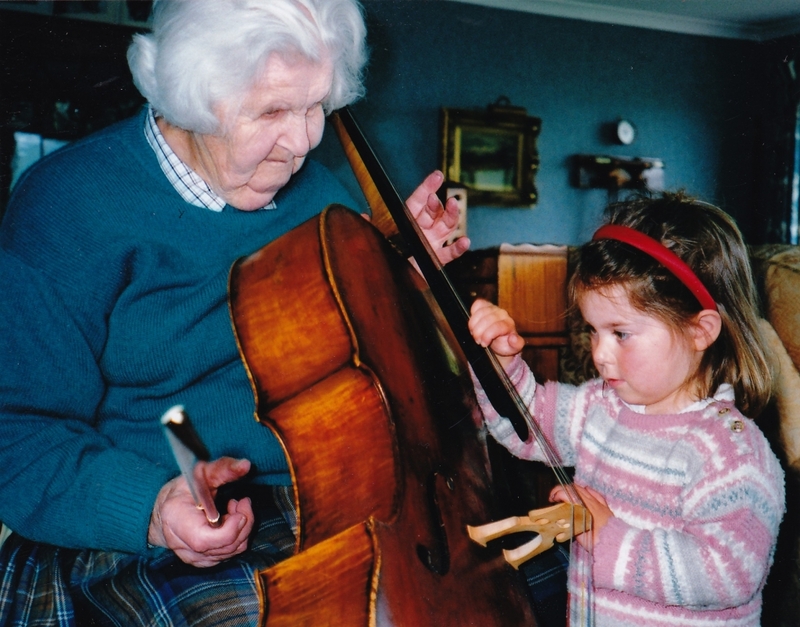 Above all, Kitty loved music and wanted to share her discovery with her pupils. That is the legacy which she has left us. In a real sense Kitty always stood on the sidelines watching other people having success. I taped an interview with her in 2000 in which she said " It was such fun when people did things well! " Her pleasure in her pupils' success gave her such a life-long interest in those people from their early years through into adulthood, that, as a result her "family" just grew and grew. All of us felt part of her family. She had an encyclopaedic memory for names, even of people she had never met, and it was only towards the very end of her life that the odd name began to escape her. And I used to think of her as a walking Debretts when it came to the lineage of Scottish clans and aristocratic families! I often reflect about what I learnt from Kitty. And there are lots of things. In playing, high standards, of course, but mainly true expressiveness, beauty of phrasing, and sound. She could be scathing in her judgement of even the greatest names if they didnt seem to have paid enough attention to beauty of sound. On one occasion, without telling Ruth Waddell, she went out and spent several hundreds of pounds on strings and decent cello end-pins, so that the cellos in the Waddell School ( some of which were in a pretty bashed-up state ) would sound better. Ruth remarked on how much better all the children were playing, but never knew why. She had no time for empty musicianship, music had to convey somrthing important, something meaningful. Her ability to guide and at the same time give the pupil space to develop in his or her own way was, I think, the mark of a great teacher. She could be firm but never dogmatic, and behind all of her advice was sound common sense. Above all she wanted the experience of playing to be a pleasure. Outside music, I shall always remember her wonderful sense of fun, her infectious laughter, her love of the natural world, things Scottish, and above all her love for her family, her sister Ann, nephew David and his family, and nieces in Canada. It was from her that I first remember hearing about the Treshnish Islands, which kindled in me a desire to go and see for myself this place which she loved so much. She told a wonderful story against herself about how, on one of those Mull holidays, she fell overboard from a dinghy. All efforts to pull her on board failed, and she had to be towed into land like a beached whale. And of course she roared with laughter re-telling the story. The latter years Kitty bore with typical fortitude, rarely complaining, making light of the difficulties and still spreading her sense of fun and enjoyment around her. Her philosophy was a simple one of faith in life and the kindness and goodness of people, qualities which shone out of her. We shall all miss her so much. Kitty's !00th Birthday Party !